Crowdfunding is ridiculous. It just means people get to make a game without having to pay back their investors. Charging for a pre-order long before the game is released, like Minecraft, Interstellar Marines, Overgrowth etc is perfectly acceptable (I also pre-ordered 2 of those 3 games). However blatantly asking for people to become investors who get no return is wrong. The difference is that normal investors invest in a project because they want to profit from it. Crowdfunders invest in a project because they want to have the final product. I agree, its also it great way to launder money and avoid taxes which is why it hard to do in the UK. Investment isn't restricted to high net worth individuals you just have to provide avoidance that tax avoidance and money laundering isn't taking place and for Â£10 it just isn't worth it. Asking is never wrong, so long as you disclose up front what you'll be giving back. If you're not lying about what your investors are likely to receive (ie, not a damned thing) and they choose to "invest" anyway, how is that wrong? Other than cutting out traditional investors who expect a return, that is, and again.. how is that wrong? Oh no, you have caught on to my evil plot! Minion 37, Execute Order 72! 750k? Pah, its 895k now! Seriously, this thing is amazing. 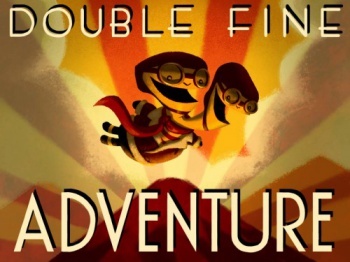 Double Fine and Tim Schafer are responsible for some of the greatest games of all time (Grim Fandango, Psychonauts, Day of the Tentacle [well, that was Tim Schafer]) so it's not THAT surprising. Sir, I'm not sure you mean collect the dry cleaning and bring back a pepperoni pizza. Don't you mean Order 71 Kill them now? Ah, yes, Order 71 would be useful as well. Minion 41, 5 and.... 18! Execute Order 71! I just don't understand why anyone would want to invest more than the games price (or less). It's not like any of these projects are for a good cause, its giving money to people so they can make more money, even if the game is awful and barely sells it doesn't matter to them as its all profit. The only kickstarter project I could of saw me giving a lot of money too if I had it was The Protomen's documentary. As the reward was a custom made helmet so would of been well worth the $250. Everyone knows what they are getting into when they agree to this. I don't see why our government has to have these elitist ideas that effectively on rich people can dabble in this sort of thing rather than us poor plebs with measly Â£10 to invest inf getting something we loved made. You know you can invest as little as $15? Not $250. And $15 is worth it to get a game made that with fair likelihood wouldn't be made otherwise. I don't care about their profit, I care about the game and how much money is needed to get it made, which to me is a good cause as it's a good game. Yes there is a lot of faith he won't just blow all the money on hookers and blow but I don't think he could get away with using this money in any other way than investing in the game with reasonable salaries. As with any investment there is accountability and legal contracts. Cash returns aren't everything, sometimes you can get something far more valuable than money out of an investment. I'm sure you realise that. People ARE getting something out of this. Hmm. This is interesting, considering I donated $15, and I live in the UK.